I don't even know how I'm surprised that I was convinced to spend 3 days down the shore with my best friend from high school this week. Rereading the Facebook messages, it literally took me 8 minutes to go from "I don't know, it's hard to get to shore points from DC, eh, I'll think about it but I'm really saying no..." to "Alright, you'll pick me up at what time in Philadelphia? I'm booking the bus now." This is just my life with her. I'm spontaneous by proxy. I've accepted it and moved on. I have such a problem with eyeshadow. 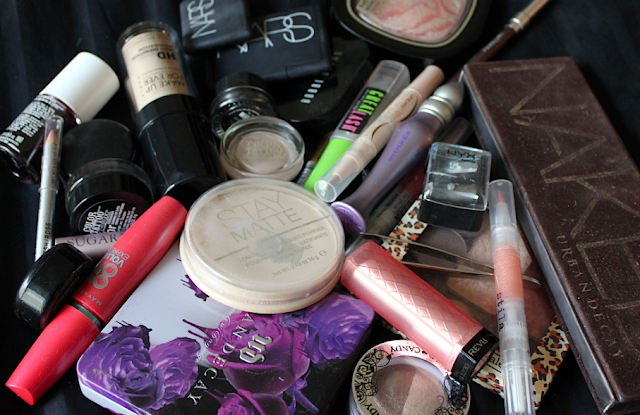 I think I'm reasonable with packing the rest of my makeup - just my everyday products. A highlighter thrown in. A lip balm with SPF, one lipcolor, two glosses, a lipliner. And then about 20 eyeshadows. I can't just say that my 12 pan Naked palette will cover it for 3 days. I'm no mathematician but I know you can get a lot of combinations out of 12 different eyeshadows. No, I have to bring at least 10 more. I'm that unreasonable. I'm sitcom laugh track level over the top with packing nail polish. My nail polish addiction just seems like such an exaggerated part of my personality but I can't help it. I'm just a parody of myself. I'm pretty proud of myself for narrowing it down to this for a 3 day trip. I had to restrain myself from throwing all my neons into the bag, too. I love having a loud, glowing neon color on my nails but I save them for summer days when I know I'm going to be out in the sun. I'm not settling for less than their full in your face effect that the sunlight brings out. A beach day is obviously the perfect setting. I'm bringing China Glaze Pool Party (the perfect neon hot pink), China Glaze I'm With The Lifeguard (an obnoxiously bright, shimmery lime green) and Essie's Knockout Pout (a warm baby pink) for my neon fix - plus OPI's Alpine Snow to use as a base to kick them up a notch. 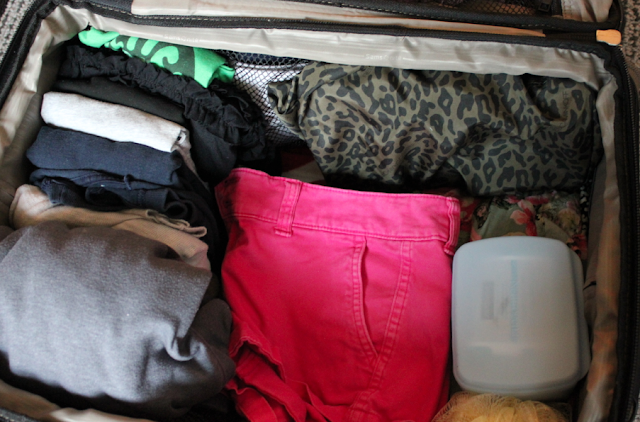 This half full suitcase is a pretty accurate depiction of my closet. Half of my stuff is blah basics in neutrals and black and navy and black. The other half is hot pink, leopard print and rhinestone studded. Some people mix and match their high/low end pieces, I mix and match my Jersey girl tween and normal person pieces. I was marveling at how lightly I had packed this suitcase (even though I have way too many outfits for 3 days) but the space was filled by my toiletry bag, straightener, nail polish bags, cosmetic case, blow dryer, blahblah. I've been called low maintenance before, if you can believe that. My nail care basics and some jewelry thrown into those little satiny pouches that I have about a dozen of but would never be able to tell you where from. They just exist here in my life. So it is. 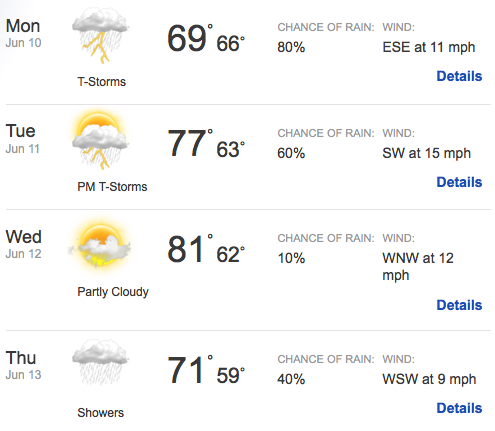 This packing for fun in the sun might be all for nothing, though, if you're willing to believe this weekly forecast. Like, honestly? Bad things happen to bad people. Rai-i-ain, on my vacation days! A free ride when I've already paid! This might be a blessing in disguise because I'm nowhere near bikini ready. I'm Victoria's Secret outlet sweatshirt with the hood pulled over my head ready. I'm buy a box of salt water taffy and some cheese fries to go ready. 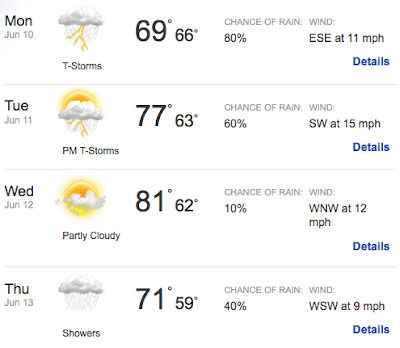 I can't even stress how badly I should not be in a bathing suit right now. Like, to prepare myself for this trip I dieted for 2 days and then ate Ray's Hellburger and Chipotle for my weekend dinners. My "are you feeling okay?" level paleness and backfat aren't bikini ready. I was planning and hoping to roast a little in the sun but I'll just take it as divine intervention if it's too rainy to allow that to happen. Either way, fun fun fun 'til daddy takes the T bird away.